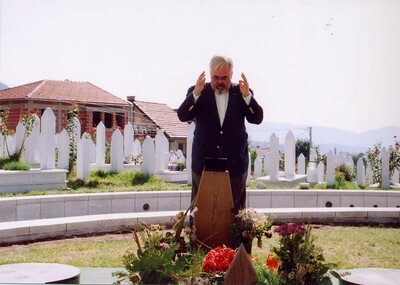 Stephen Suleyman Schwartz reads memorial prayer at the temporary grave marker of Bosnian president rahmetli Alija Izetbegovic, 2004 -- Photograph by Joshua Mensch. Sarajevo–Last week I reported in NewsGram on the long-running confrontation between Wahhabi interlopers and Albanian-speaking Sufis in Tetova, a city in western Macedonia. The Muslim-majority country of Bosnia-Hercegovina is better known in the Islamic ummah, as the site of brutal atrocities by Serbian invaders during the Balkan war of 1992-95. The horrors of Bosnia were dramatized anew by the recent arrest, and transfer to The Hague tribunal, of the accused Serbian terrorist Ratko Mladić. Mu'ammar al-Qaddafi, dictator of Libya." Pipes' column concluded eloquently with a photograph of Saddam Hussein about to be hanged in Baghdad. The struggle of the Muslim Bosnians against Mladić and his horde of Serbian killers and rapists touched the hearts of every Muslim in the world. Saudi-financed Wahhabis tried to "colonize" the Bosnian struggle by sending several thousand wretched specimens of Islamist degeneracy to serve as "mujahidin" there. The foreign, so-called freedom fighters did not win, or even influence the outcome, of any battles in Bosnia. Rather, they stained the reputation of Bosnia by committing atrocities. For this reason, among others, imported "mujahidin" were excluded from the war waged in 1998-99 by the Kosovo Liberation Army, to whom NATO loaned its air power. But missionaries of the Wahhabi da'wa appeared in Bosnia-Hercegovina and Kosovo alike after the armed confrontations with Serbian imperialism concluded. In both places, local Muslims, devoted to their Balkan traditions, warned that radical Islam represented a worse threat than that posed by the Serbs, since the Serb aggression aimed at the physical liquidation of the Bosnians and Kosovar Albanians, while the Wahhabi invasion sought the corruption of souls among the Balkan Muslims. Sixteen years have now passed since the end of the Bosnian war in 1995, and twelve since the defeat of the Serbs in Kosovo in 1999. Serbian intrigues against Bosnia and Kosovo continue, and while Wahhabi outreach has been restrained since King Abdullah took power in Riyadh in 2005, Muslim radicals continue to foul the garden of Bosnian Islam. Macedonia includes, as I have noted, the front line of Muslim resistance to extremist intimidation and usurpation, while Bosnia-Hercegovina is a rear-guard zone where Islamist ideology seeks the seduction, subversion, and servitude of the Muslim mind. Similar skirmishes disrupt the lives of Muslims in south Serbia, and particularly in the Sandžak region divided between Serbia and Montenegro. In Sarajevo, lively intellectual combat sets the protagonists of reactionary fundamentalism against those of a forward-looking, progressive Islam. Late in May, however, a tawdry quarrel broke out when Emir Suljagić, a former scribbler for the formerly sensationalist neo-Communist magazine Dani, whose lack of journalistic ethics had been demonstrated, resigned from his post as minister of education for the canton (region) of Sarajevo. Dani has improved, it must be said, since it was freed from the ownership of a pseudo-journalistic adventurer, Senad Smećanin. It has been taken over by the outstanding daily Oslobođenje [Liberation], best known for its heroic reporters who continued their work through the fire and smoke of the Sarajevo siege – in which the newspaper's building was rocketed by the Serbs and burned. Suljagić had proposed that religious instruction be optional in the public schools and that students' performance in that subject not be included in the assessment of their academic success. A pathetic figure, Suljagić was then attacked as "Islamophobic" by Bosnian chief cleric Mustafa efendija Cerić, a paragon of ideological opportunism who has sold Bosnian Islam at a low price to the fundamentalist enterprise headed by Qatar-based hate preacher Yusuf al-Qaradawi. Cerić warned Suljagić, a government representative, that Sarajevo could undergo a turbulent summer comparable to the mass protests that led to revolution in Egypt. The grotesque irony of this situation is that if the Sarajevo masses were to rebel, Cerić would more likely be their target than Suljagić. Cerić's corrupt dealings with Serbian gangsters are entangled with his promotion of an Islamist ideological apparatus that has a foot in Bosnia-Hercegovina and the other in Serbia. Cerić has even indicated that he wants to be succeeded as Bosnian Islamic leader by Muamer efendija Zukorlić, who occupies the dishonorable post of "grand mufti of the Islamic Community of Serbia." For his part, Zukorlić recently played host in Serbia, the place whence attempted genocide against the Balkan Muslims originated, to the radical Islamist and leftist philosopher Tariq Ramadan, "intellectual" companion of the crude bigot al-Qaradawi. Cerić was reproached for his attack on Suljagić by the so-called "high representative" or international dictator in Bosnia, Valentin Inzko, an Austrian. Inzko, in a blabbermouth idiom suited more to the satirical cafes of Vienna a century ago than to a war-scarred country in southeast Europe, alleged absurdly that Cerić's comments were "contrary to human dignity" and encouraged "hatred and mistrust." Inzko seems to have forgotten, and few seem to have thought to remind him, that religious instruction is offered in the school system of his native Austria, with teachers paid by the state, in a paradigm closer to that of Cerić than of Suljagić. Cerić, unfortunately correctly, considering his own disgraceful career, described Inzko's remarks as "Islamophobic rhetoric in which nothing is sacred, including the will of parents and children to support religious education in the schools." A regrettable fate may seem to have befallen Bosnian Muslims, when their representatives include, from the secular side, the "journalist" Suljagić, and from the religious side, the "Davos-style" personality Cerić and his satellite Zukorlić, with the opinions of the country's own offspring mediated by the mendacious al-Qaradawi, the incendiary Ramadan, and the foreign usurper Inzko. But all is not lost in Bosnia. The country still possesses honest Islamic thinkers who speak their mind freely and do not hesitate to emphasize that, as the lyrics of a Bosnian classic folksong have it, "power rests on evil." Prof. Esad Duraković of the University of Sarajevo, an Arabic scholar of supreme talent and achievement, exposed an example of Islamist demagogy by Cerić and his clique, in an Oslobođenje column published on June 1. Duraković demolished attempts to support the award, by Cerić's gang, of honors as a Bosnian gazi or "heroic Islamic warrior" to the Muslim politician Ejup Ganić. Ganić had been a member of the presidency of the Republic of Bosnia-Hercegovina during the 1992-95 war. But as Duraković correctly pointed out, bestowal of the title of Muslim gazi by a RELIGIOUS leader (Duraković's upper case) was inappropriate for Ganić since the wartime Bosnian presidency was supranational and secular. Indeed, Duraković wrote, recognition as a "gazi" should also have been extended to such worthy and distinguished defenders of Sarajevo and Bosnia as the ex-Yugoslav military officers Jovan Divjak, a Serb, and Stjepan Šiber, a Bosnian Catholic, as well as non-Muslim but Bosnian-loyalist politicians including the ethnic Croat Stjepan Kljuić and Mirko Pejanović, also Serbian, among others. Duraković's clear message broke through the screen of intrigue and dissimulation erected by the three enemies of the Bosnian Muslims: neo-Communist political operators like Suljagić, Islamist lackeys of the Cerić variety, and foreign potentates of the Inzko breed. These three types of parasites hang on the mutilated body of Bosnia-Hercegovina like leeches, sucking the blood of the country. All three should be forced to pursue honest work and be removed from their seats as bureaucrats. If a "Sarajevo summer" were to accomplish that aim, it would be a marvelous event in Bosnian and Islamic history. Meanwhile, Bosnia still contends with the shadow of Wahhabi terrorism. On June 6, Bosnian police arrested a terrorist suspect, Adnan Rečica, aged 26, in the divided north Bosnian town of Brčko. Rečica had in his possession four kilograms of TNT, a half kilogram of plastic explosive, celphones wired to set off bombs, military equipment including firearms, mines, and detonators, and camouflage uniforms, along with Wahhabi literature in Arabic. Bosnian media reported that Rečica's mother Edina, 45, and his relative Ervin Jasenčić, 23, were also detained. It was further revealed that Rečica was an honored guest in the Wahhabi colony at Gornja Maoča, a hamlet dominated by the most prominent Bosnian Wahhabi currently active, Nusret Imamović, who was an accomplice in the bombing of a police station in the Bosnian town of Bugojno last year. Rečica was sheltered by Imamović's associate, Hajrudin Ribić, who is notorious for killing a hunter's dog he claimed was "forbidden" by shariah law to enter Gornja Maoca, and who also desecrated an Orthodox Christian cemetery. Ribić rejected the authority of a Bosnian court unless it was founded on shariah. Other members of the same Wahhabi conspiracy include Maksim Božić and Enes Sejranić from the large city of Tuzla. Božic threatened police officers with a gun and was arrested. The latest blows against extremism in Bosnia have been ignored by western media. Bosnia-Hercegovina needs the help of all moderate Muslims everywhere in defeating the radical incursion.